There are but a few minutes until I turn into pumpkin... that's if I don't fall asleep first - or get utterly frustrated with all the typos I keep making (yuck, remember the Tippex days??!?). 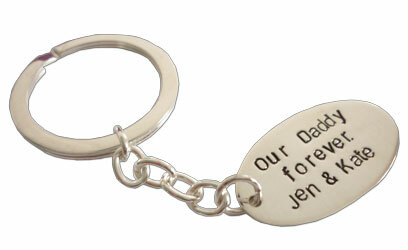 Hand Stamped Sterling Silver Keyrings! Check them out! A massive thank you to Kath from SANDS in Brisbane for the inspiration to complete this project! I hope all the amazing Dads had a beautiful day on Sunday - and I also hope all those single parents gave themselves an even bigger pat on the back. Hats off to them, I really don't know how they do it.